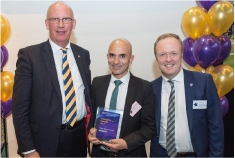 At the 2017 Loughborough University Enterprise Award ceremony, held on 18th May, Prof Gilberto Montibeller and Prof Alberto Franco were announced the winners of the Impact from Research category for the work they have done on managing bio-security threats. For more info visit the Enterprise Awards website. Fiona Ellis-Chadwick, the Director of Impact@SBE has been invited to speak at this event which will take place on Thursday 11th May. The early successes and challenges faced in delivering effective business support through regional growth hubs will be discussed, with input from both the private sector and key stakeholders…. Impact@SBE’s Director, Fiona Ellis-Chadwick, is to speak at the Spotlight on Parking event on Tuesday 9th May. This invitation only event is an annual half-day seminar with four to five key speakers focusing on current parking issues.